I started 2015 with high hopes and tons of goals of things I was going to accomplish this year. When New Year’s cam, I was already a few months into my new life-hacking lifestyle of trying to make my work life super efficient, so I could appreciate and experience more of my family and personal life. I decided to try to come up with some really bold goals, goals that would seem far-fetched to combine in one year, but all possible if I did the work to take steps every week, or every month. 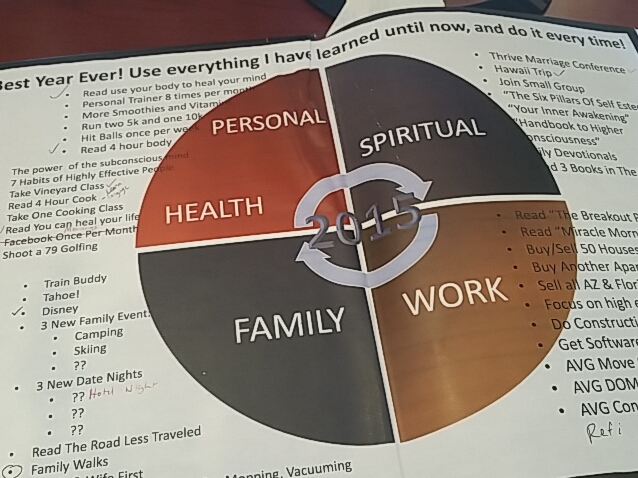 I separated my goals into categories of Personal, Spiritual, Health, Family, and Work. I wanted to dramatically improve my health, read many books, improve family life, and start several new hobbies. I started January off strong, my plan was working like clockwork, then my wife had a huge health scare. By end of January, when I called 911, I thought my wife had passed away. Thank god she hadn’t, and she woke up, but the next few weeks would be a challenge. After ambulance rides, weeks of IV fluid, doctor’s visits, plastic surgery, blood transfusions, etc, she fully recovered. For those weeks we completely shut down our business, Kaleena was on bed-rest and the kids still had to keep their lives going. Needless to say, my New Year’s Resolution list took a back seat. After picturing life without my wife, our whole perspective on living each day to the fullest and focusing on family changed. February came and we were back on track, then one morning after church, I received a horrible text from my mom. After a routine surgery, my dad had fell in to a coma. I spent the next couple weeks in Portland with family, and as a miracle from god, he woke up. We each had a few days with him, but unfortunately soon after he passed away. My dad died way too young, and I was far from ready. The painful emotions I still feel every day are beyond what I can include in this post, as he deserves much more than a paragraph, so for now I will just say that I think about him everyday, and my life will never be the same. In spite of these dramatic challenges, the bold goals of the year are still on track.. I have read 7 books on my list and also started 2 that were horrible and decided not to finish. My eating habits, and exercise habits are better than they have ever been. I have several hobbies now that seemed way to bold at the start of the year including making my own wine from my vineyard (And all that having a vineyard entails), beekeeping (I captured a wild beehive), and cooking. If you want to try to accomplish great things, I don’t think you need to wait until New Year’s for that tipping points moment. Write it all down, big and small. What do you want to do with your life? Look at the list every day and see what you can do about each of them. Maybe today all you are doing is scheduling a cooking class or a vineyard trimming class next month, but if you take these little steps, a lot can be accomplished.